Communication is one of the cornerstones of the intelligence process, and recent developments in multimedia communication are likely to have a major impact on how intelligence analysis is presented to the user of the intelligence product. Digital communication is driving deep changes in the way information is produced and consumed globally and across industries, posing challenges to how intelligence analysis is delivered from the perspective of both the producer and the consumer. These changes will affect the concepts of usability, user experience, interaction design, and information design. 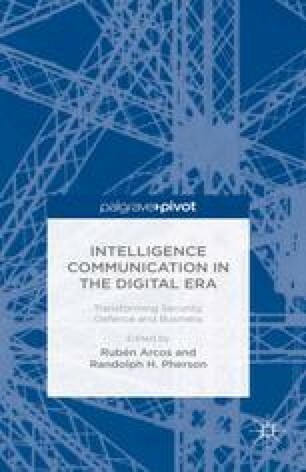 Although intelligence agencies have their own distinctive features in relation to intelligence clients at the corporate level as well as certain security standards and counterintelligence imperatives to guarantee, they will need to adapt their intelligence products to the digital era to remain competitive.